Workplace accidents, car accidents, truck accidents, and motorcycle accidents often result in various types of foot injuries. These injuries can be extremely debilitating and life changing. Suddenly, through no fault of your own, you find that you can no longer enjoy activities that have been an important part of your life up to the time of the accident. Often surgery, physical therapy, and weeks of limited activity are required for optimum healing. Some of the most common foot injuries include compartment syndromes, fractures of the metatarsals, and fracture of the heel bone (calcaneus). 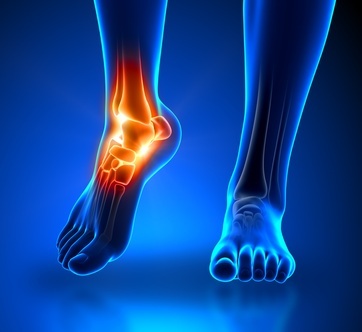 Acute foot injuries that often result from work or motor vehicle accidents include severe bruising, torn ligaments, puncture wounds, ruptured tendons, joint sprains, muscle strains, as well as various types of broken, fractured, shattered, or dislocated bones. Compartment syndromes of the foot typically result from workplace, industrial, agricultural, warehouse, and motor vehicle accidents. When a heavy object runs over, crushes, or impacts the foot, swelling occurs along with severe pain. The foot structure consists of many small compartments. These compartments are filled with muscles, nerves, and tendons and are lined by a tight membrane. When an injury to the foot occurs, there is often some bleeding in the muscle tissue, causing the foot to swell and expand. The lining of this membrane has a limited capacity to expand. If the fluid and muscle swelling inside the compartment becomes significant, they may exceed the blood flow in and out of the small compartments. If the pressure inside the compartment increases too much, the nerves and muscles start to get squeezed and stop functioning properly. Injuries to the metatarsal joints are quite common. They can occur from something as simple as twisting your foot when stepping unevenly or may occur from more violent injuries such as a fall, work accident, or car accident that crush the metatarsals. Surgery is required in most of these injuries. The broken or dislocated foot bones often need screws that are inserted internally into the bones across the joints for optimum healing. If surgery is not performed, then a boot or a cast is used. It can take eight to ten weeks for this fracture to heal with a 70% success rate using the cast. Surgery has a better success rate with a six-week healing time. The screws are typically left in for four to five months after the surgery and then removed. No walking on the foot is permitted for six weeks, and then walking is allowed with a removable b oot for the next four weeks. Swimming and biking are permitted early on after the surgery. If left untreated, full healing may never occur which means you will never return to your normal activities and which also may lead to painful arthritis that requires treatment. Fractures of the heel bone are debilitating injuries. Usually, these fractures occur from car accidents and work accidents when a tremendous force crushes the heel and fragments the bone. Surgery is required to put the bone back together with a metal place and multiple screws. This procedure decreases the likelihood of severe arthritis later on and maximizes the potential for a good recovery. If the bone is severely crushed, the bone may also need to be fused. Following the surgery, no walking on the foot is permitted for three months, and physical therapy is required. Typical recovery time is about six months. Occasionally, the surgery does not result in healing and must be repeated. Surgery on the heel should be performed as soon as possible after the injury to prevent permanent widening and deformity of the heel in addition to chronic pain and arthritis. If your foot or heel injury has resulted from an accident due to the negligence of another driver or your employer, please contact our office and we would be happy to evaluate whether we can help you gain compensation for your pain, lost wages, and medical bills. Jeff Robinette at the Robinette Legal Group, PLLC in Morgantown, WV has helped many workplace accident and car accident victims get the recovery they need. Call today for your free consultation at (304)594-1800 or visit our website to learn more about navigating the legal process of recovering from your injuries. If you are a WV accident victim, we would be glad to send a free book to your home, or make an immediate download of one of our three books available to you for no cost or obligation.